5TJT publisher Larry Gordon with U.S. Ambassador to Israel David Friedman outside the U.S. Embassy. It was a momentous occasion. We were not in Kansas anymore, nor were we in the Five Towns, though it was easy to conjure up images of Dorothy and Toto on a journey to an Oz-like place. We were a delegation of 15 people led by the great activist for Israel Dr. Joe Frager and the inimitable former governor Mike Huckabee. We would be one of the first non-diplomatic delegations visiting the new United States Embassy in Jerusalem with the opportunity to sit and talk about the issues of the day with our U.S. Ambassador to Israel, David Friedman. 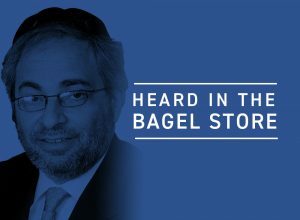 Though Israel is one of the smallest countries on the globe, she draws disproportionate attention and is a major focus of international diplomacy. So there we were, 15 supporters of President Trump and the Trump policy on U.S.–Israel relations, on a bus, riding up a steep circular roadway that separates the newly designated embassy property from the rest of the neighborhood of mostly gray-looking apartment buildings. A law of the United States passed by Congress in 1995 says that the U.S. Embassy in Israel needs to be moved from Tel Aviv to Jerusalem. And since that law was passed during the administration of Bill Clinton, every sitting president has signed a waiver to delay the move based on overriding U.S. national-security considerations. Three thousand years ago, the Psalmist wrote, “When we return to Zion, we will be like dreamers.” And that was how we felt as we moved closer to the new embassy building. We felt like we were stepping into a dream, a long-anticipated reality that was made possible in the simplest fashion after a more than two-decade frustrating delay. Thanks to President Trump, Ambassador Friedman, and the administration’s foreign-policy team, the U.S. Embassy is finally located and functioning in Israel’s capital city, Jerusalem. There are still many issues to be dealt with as the embassy takes its place on the rocky diplomatic landscape. There is an unusual dynamic at play here 18 months into the Trump presidency. The relocation of the embassy from Tel Aviv to Jerusalem seems to be one of the president’s proudest achievements amongst the many others he has accomplished over the last year and a half. 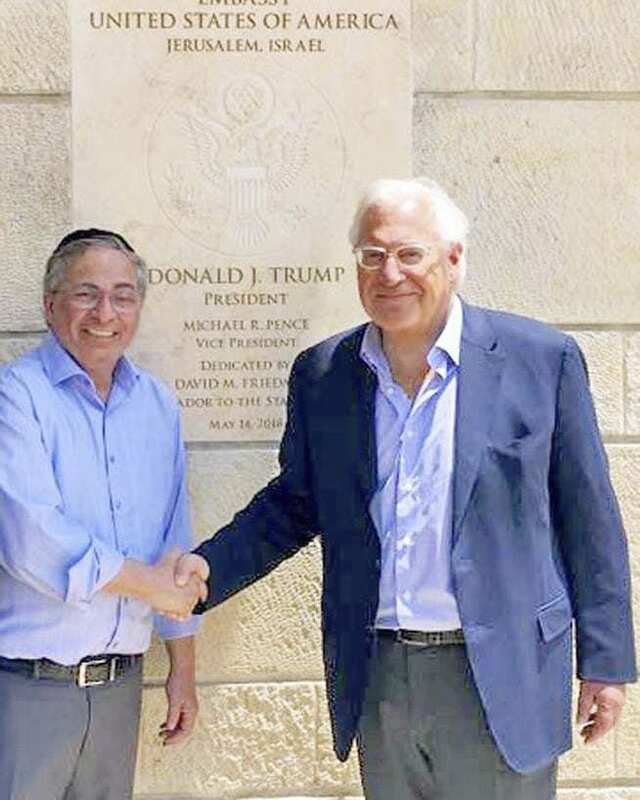 If you follow the president and the rallies he hosts around the country, then you know that rarely is there an occasion when he does not take a few minutes to talk about the embassy move and how proud he is to have Mr. Friedman as his ambassador to Israel. The ambassador was open and forthcoming about a number of issues, some of which he said, looking in my direction, were better off not published even though to some extent the news on these issues is already out there. So there were really no big secrets revealed, though there were matters that do not get a lot of publicity because they occur mostly behind the scenes. Those of you who visit Jerusalem on any kind of regular basis are most likely familiar with the imposing and impressive structure that is the U.S. Consulate on Agron Street in the city. The consulate is located down the street from Rechov King George and you pass it on your way to the Waldorf-Astoria or the Mamilla Mall or on your way to the Old City of Jerusalem. If you walk by the consulate side of the street there are always American security personnel standing outside, about 20 or so feet apart from one another. Of course, this is a safe part of town, but this is an American outpost in a foreign country, and, after all is said and done, it is the Middle East. The intriguing thing about the U.S. Consulate in the city, we learn, is that this is one of only two cities in the world in which the consulate and the embassy function independently of one another. (The other city is Hong Kong.) This can and does lead to all forms of inefficiencies and confusion. Why these two entities function this way is as intriguing as it is complicated. The brief answer is that the consulate was opened in 1844, more than a hundred years before the State of Israel was founded, so to speak, or opened for business, in 1948. According to Ambassador Friedman, the reason for this setup is that the Agron Street Consulate is there primarily to serve the Palestinian population while the embassy in Tel Aviv was, until the relocation of the embassy, the address for whatever services Israelis or Americans living in Israel required. Those of us who have been following this issue and this administration carefully, can tell that the Trump administration governs from a reality-based perspective. It seems careful thought needs to be given to the reason for two U.S. missions in one city. 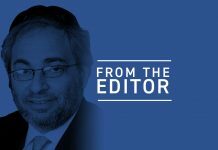 There requires some real deliberation in terms of how best to streamline redundancies to ensure that the U.S. is most effectively and efficiently represented in Israel. Those of us who have been supportive of President Trump’s administration, especially regarding the refreshing change towards our ally Israel, should not be lulled into complacency that because the embassy was moved, all goals have been achieved. Furthermore, even with the fantastic new leadership of Secretary Pompeo and Ambassador Bolton alongside our Ambassador Friedman there is tremendous work to be done, and government bureaucracy has not changed simply because some policies have shifted. It seems from Ambassador Friedman that while he thought the embassy move would take much more time, he accomplished it on his 365th day in country, but there is still a lot left to be accomplished. As for the so-called “grand plan” being drawn up by the Trump administration that is being touted by Jared Kushner and lead negotiator Jason Greenblatt, the ambassador said he is hopeful for success but is disappointed that there is no identifiable personality representing the Palestinian side who can reach an effective and implementable peace plan with Israel. Perhaps the greatest story, as repeatedly retold by the president, is how this location came to be the location of the U.S. Embassy in Jerusalem. At various points prior to the move, the idea was floated to spend $1 billion on the construction of a new embassy facility, which may have taken anywhere from five to ten years to complete. That plan might have been fine and even good, but the reason it was supported by elements in the White House and State Department was because the bottom line would be that the new embassy would not be opened for as much as a decade. While that may have been an acceptable plan to many, it did not sit well with at least two people — President Trump and Ambassador Friedman. We were told that we may have been the first civilian American group of this size to visit the embassy and meet with the ambassador since its opening in May amid great pomp and media attention. Even more so, you can tell that our group had not been welcome guests at embassies in the past, as we assumed we could bring in our cellphones and assorted electronics with us. It became obvious to us that the embassy is not merely changing a sign on the wall, but the security and standards used at our embassy in Jerusalem are equivalent to or better than those in other U.S. embassies throughout the world. So back to the 15 of us, with our assorted cellphones and electronics. Our neighborhood’s very own Aryeh Lightstone (Ambassador Friedman’s senior adviser) is a quick problem-solver; he spotted my wife’s shoulder bag, and after asking her if we could use it, he requested that everyone deposit their phones into her shoulder bag, which he then placed in the backseat of his car parked nearby. It is an incredible feeling to see the professionalism and esteem that the embassy employees have for securing and working at the international mission that the president is most proud of. Ambassador Friedman and his team are not done. We are also told that over the next two years, the plan is to expand the embassy campus, so to speak, to 18 acres and to construct an additional building for what will always be a flagship embassy of the U.S. in the Middle East.